Looking for a weekend project that can quickly transform a room? Consider adding molding or faux ceiling beams. These decorative touches add architectural interest while giving any area a polished look. If you have a plain Jane room screaming for something more, decorative moldings and beams are just the ticket. Decorative molding adds detail while making a room appear larger or taller. It can help you creatively transition from one material to another. 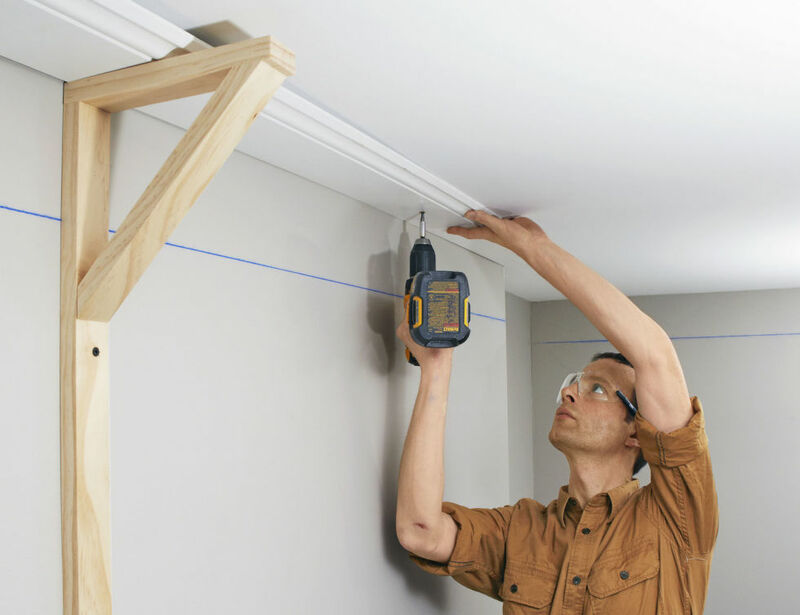 With accurate measurements, precise cutting and an extra set of hands, installation is easy. Some molding materials like plaster require a skilled technique, which is why leaving it to the professional is the best option. Casing – Covers the gap where a door frame or window meets the wall. Baseboard – This molding is used in addition to quarter-round to blend where the floor meets the wall. Crown – Also called cornice molding, it is used to blend where the walls meet the ceiling. Can give the illusion of height to a room. Chair rail – Originally meant to protect walls from furniture bumping them, the chair rail is often used to transition between two different wall coverings (for example, paint and wallpaper). Picture rail – If you don’t want to damage your walls with nails or hanging brackets, install a picture rail to display your artwork. Cove – This concave shaped molding is used like crown molding and is less ornate. Dentil – A style of crown molding with a pattern of evenly spaced blocks resembling teeth. Used in historical homes. Egg and dart – A pattern of crown molding that has oval egg shapes alternating with V-like darts. Styled after the facades of Greek temples. Batten – Also known as Board & Batten, this is used to hide the joints between wall panels. Bead and pearl – This crown molding style has a row of symmetrical spheres or pearls running along it. Often combined with other crown molding design elements like leaves, darts or spindles to form elaborate combinations. Molding is no longer just made from wood. In the past, trimming a curved wall would have been tricky. With today’s bendable substances, like flexible polyurethane, installation is a breeze. It cuts and mounts like wood molding yet conforms easily to whatever angle you need. Wood – The most popular material used, wood is affected by humidity, which will cause it to expand and contract. Use a flexible caulk on the joints to avoid gaps later. Plaster – Beautiful, elegant and tricky to install. Leave this job for the professionals. Can run $25-50 per foot installed. Flexible polyurethane – This lightweight, limber material cuts and installs like wood. It can also be painted or stained. Lightweight polyurethane – Unlike wood, this product will not split or crack during installation. Metal – Used with a metal tile ceiling, this crown molding comes pre-finished but can be painted. Pre-formed corners make installation easier. Hollow PVC – Great for running cables or wires around a room so you don’t have to cut into your walls. Comes in 8 foot sections. Things are literally looking up for decorative molding. Designers are adding intricate molding designs on ceilings to give rooms a visual flare the way artwork does. Need more of a statement? Add drama with faux beams on your ceiling. Fashioned from wood or plaster, these beams can create a grid-like pattern or separate different spaces in an open floor plan. Consider installing decorative molding or faux beams as your next DIY project. Finishing a room with these design features lets potential buyers know you have an eye for detail. Boost your home’s value by adding these decorative items today and reap the rewards at closing. From nail guns and miter saws to ladders and paint sprayers, our expert staff is ready to help you decide on your next DIY project. Need some additional design ideas for your home? Our blog, Tried and True Interior Decorating Tips, has great suggestions to get you fired up for your next project. As always, if you have any questions about what to choose, pricing or how-to’s, don’t hesitate to contact us. Stop by our store — we’re open seven days a week.